Wedding ceremony at Saint Andrew the Apostle Parish in Calumet City, Illinois. Most weddings are all about families. Sure, the spotlight is on the bride and groom - first dance, first kiss, reception toasts, etc. However, it's the little moments that occur throughout the wedding day that glue it all together. I could tell right at the start that Eric and Maria had tight knit families that cared deeply about them. Our day started at Maria's parent's house in Cedar Lake, Indiana with her sister rewriting the speech she would be giving later on that evening. I love to photograph these precious moments and put them in the album that is to come after the wedding. 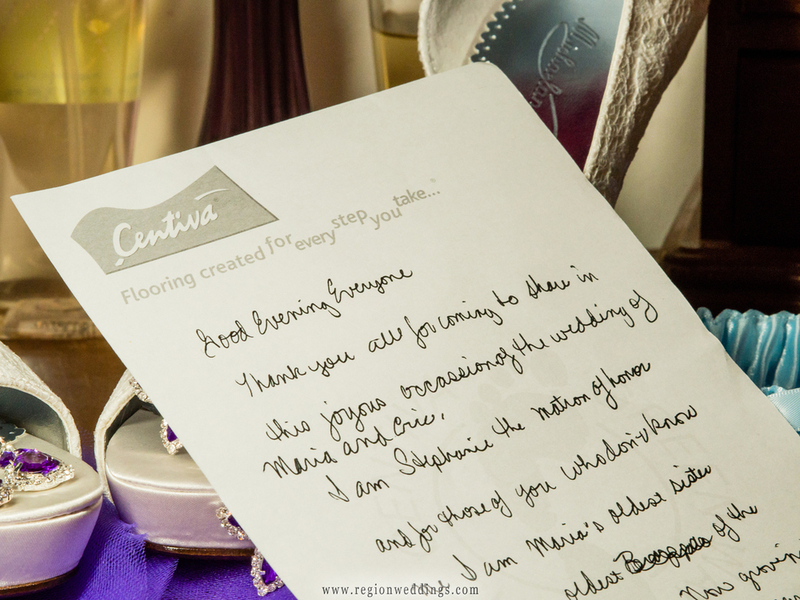 The matron of honor's speech rest against the bride's wedding shoes. 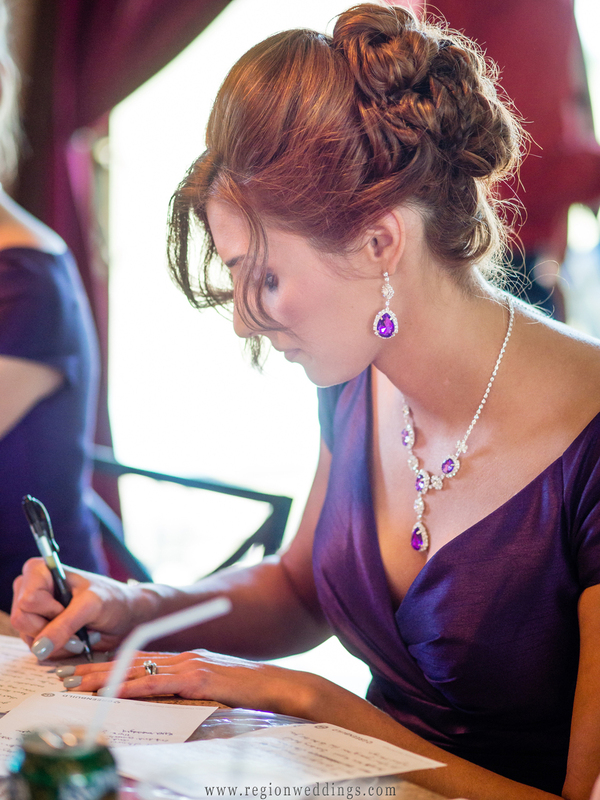 The matron of honor writes her speech for her sister's wedding. 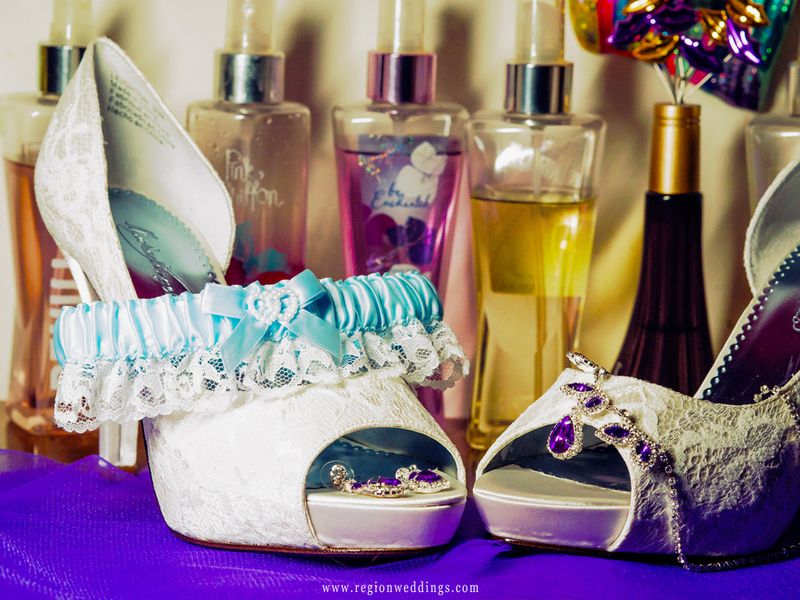 While taking detail shots, my assistant and I spotted something old, something new and something blue. Something old, something new and something blue. I could tell that Maria was a little bit shy with a camera on her while she was having her make up done. Nonetheless, she handled it all with good humor. A bride has lip gloss applied while getting ready for her wedding. The bride is all smiles on the morning of her wedding. In the shot below, Maria's sister and bridesmaid get her veil secure because the mean photographer guy (that's me) has decided to take them outside on this windy and chilly day for some group shots!! the bridesmaids help secure the bride's veil before her wedding ceremony in Calumet City, Illinois. The bride is surrounded by her friends on the porch of her parent's home in Cedar Lake on the morning of her wedding. 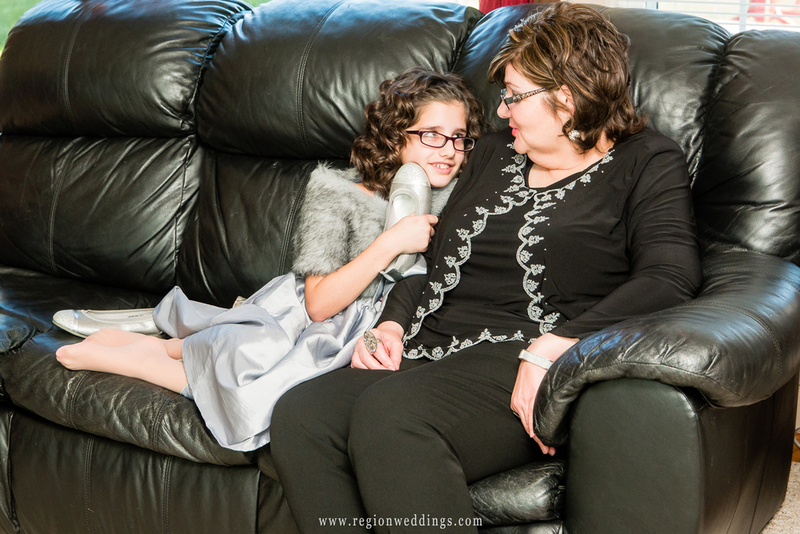 When you are the junior bridesmaid and your simply waiting for the bride to be ready, might as well curl up on the sofa with your shoe for awhile. I mean, it's going to be a long day, right?!! The flower girl curls up on the sofa on the morning of her big sister's wedding. Maria braved the cold to show off her dress underneath the blue sky and puffy clouds. Soon we were off to Saint Andrew the Apostle Parish for Eric and his family photos along with the groomsmen. A beautiful bride shows off her dress underneath the blue skies on the morning of her wedding. The groomsmen take a walk in the autumn leaves outside Saint Andrew's Church. Saint Andrew the Apostle Parish is simply an amazing building. 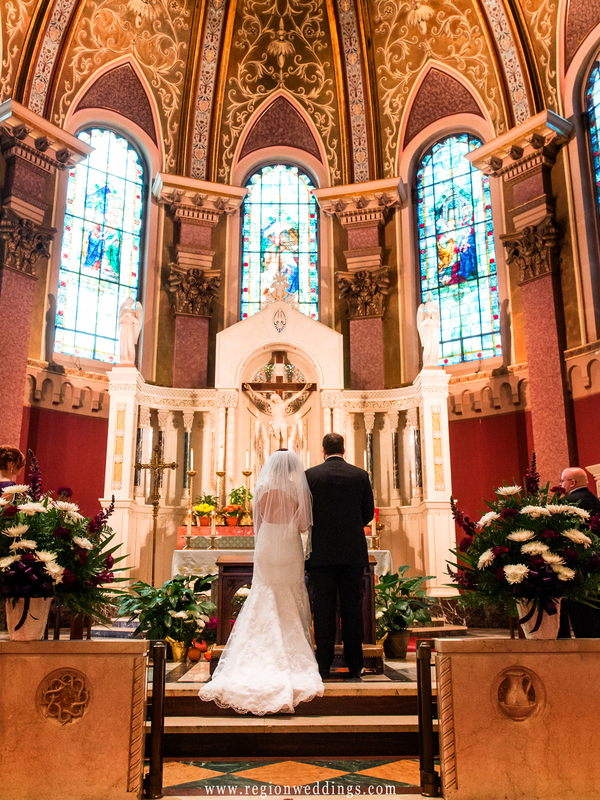 I can't wait to show off the images I was able to take during this Catholic wedding ceremony. The congregation gathers for a catholic wedding ceremony at Saint Andrew's Church in Calumet City. The bride and groom exchange rings on the altar of St. Andrew. The bride and groom pray during their wedding at Saint Andrew's Church. We took family pictures inside the church after the ceremony and a few outside as I left the couple alone to simply soak in the fact that they were now united together. 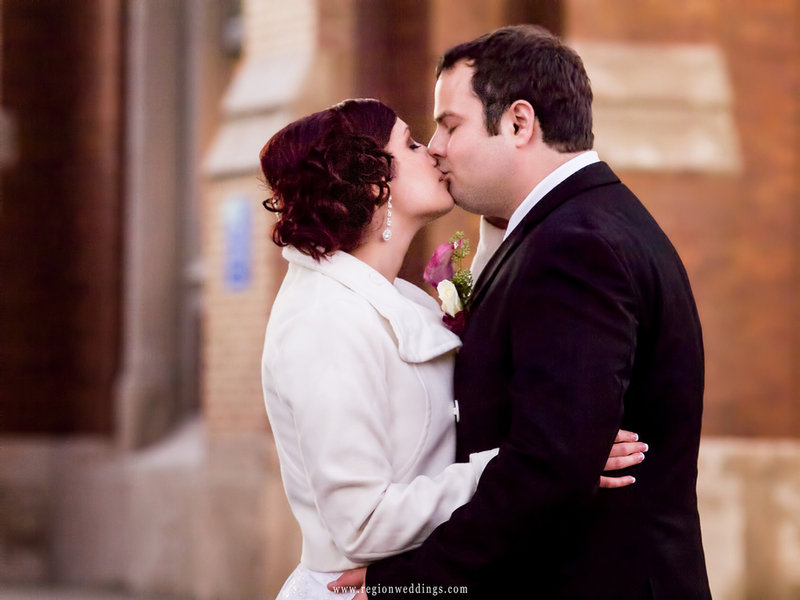 The bride and groom have a tender moment alone outside the steps of St. Andrew Church. The reception took place at The Dream Palace in Lynwood, Illinois and once again the family atmosphere was everywhere in the celebration. Stephanie, the matron of honor finally got to deliver her speech and children celebrated by crowd surfing the dance floor while guests laughed it up during the cocktail hour. 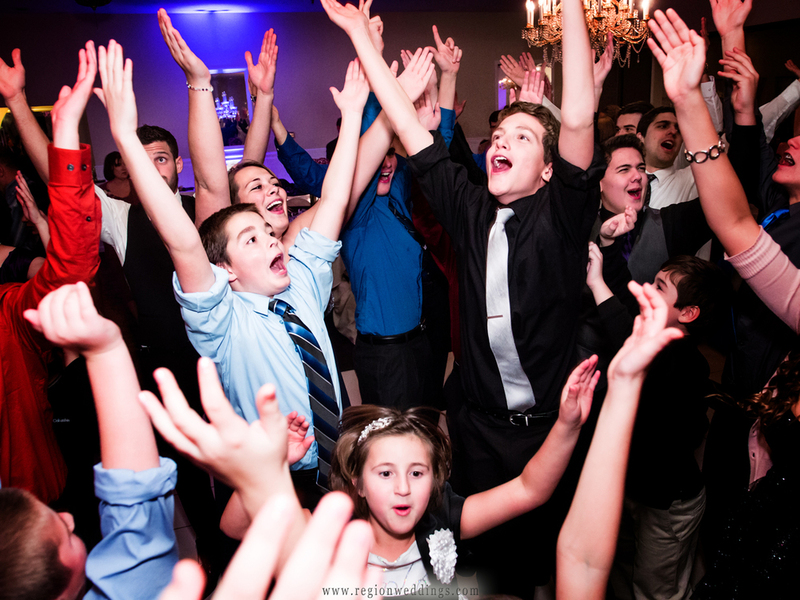 A child crowd surfs at a wedding reception at The Dream Palace in Lynwood, Illinois. 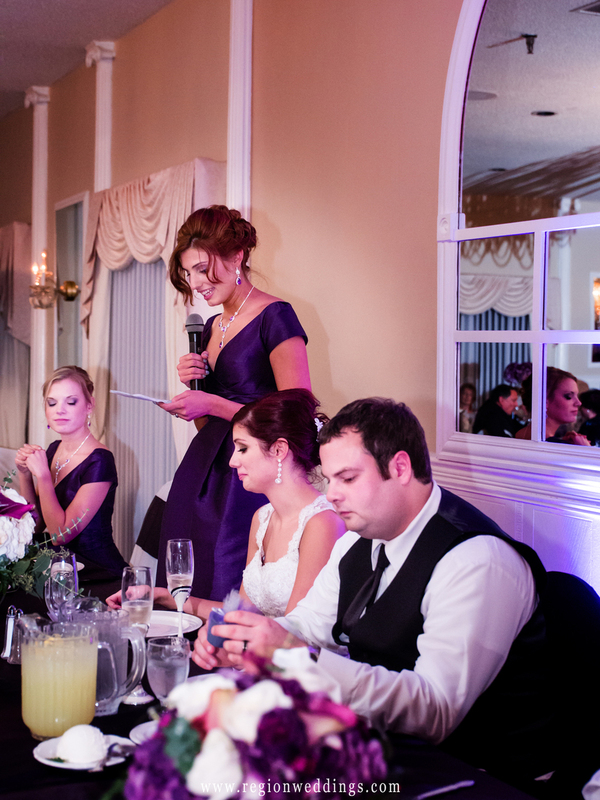 The matron of honor delivers her speech at her sister's wedding reception at Dream Palace. Guests laugh it up during cocktail hour at their friend's wedding reception at the Dream Palace banquet hall in Lynwood. A delicious dinner (with steaming hot bread rolls!!) was served along with cupcakes for dessert as well as a smores bar. 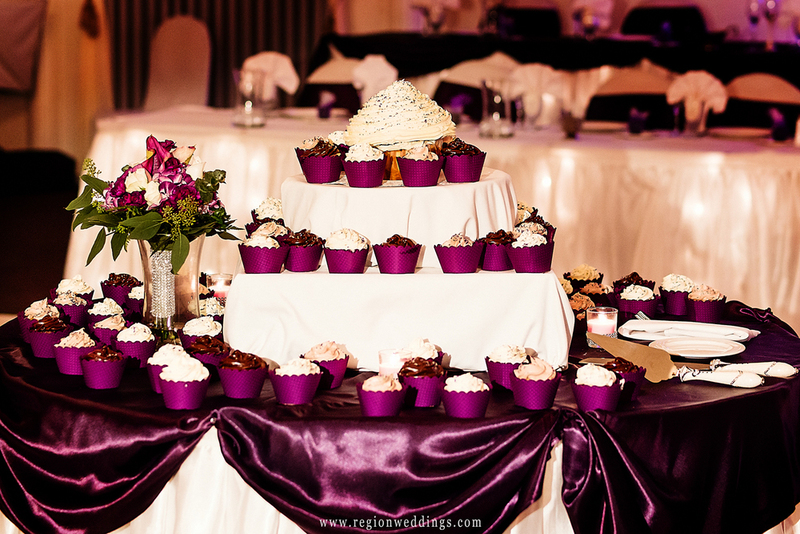 A mountain of cup cakes are served at a Fall wedding reception at Dream Palace. Can you guess what 1970's dance song these guys are boogieing down to? The dance floor is packed while the 1970's disco song YMCA plays loudly. 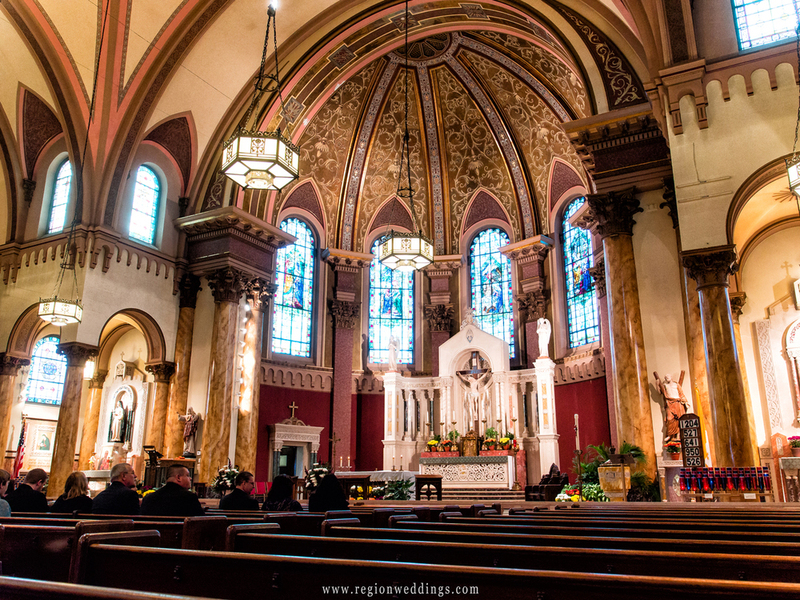 I hope you have enjoyed this sneak peek at Eric and Maria's wedding at Saint Andrew the Apostle. Stay tuned for more photo updates here and on the Region Weddings Facebook Page. 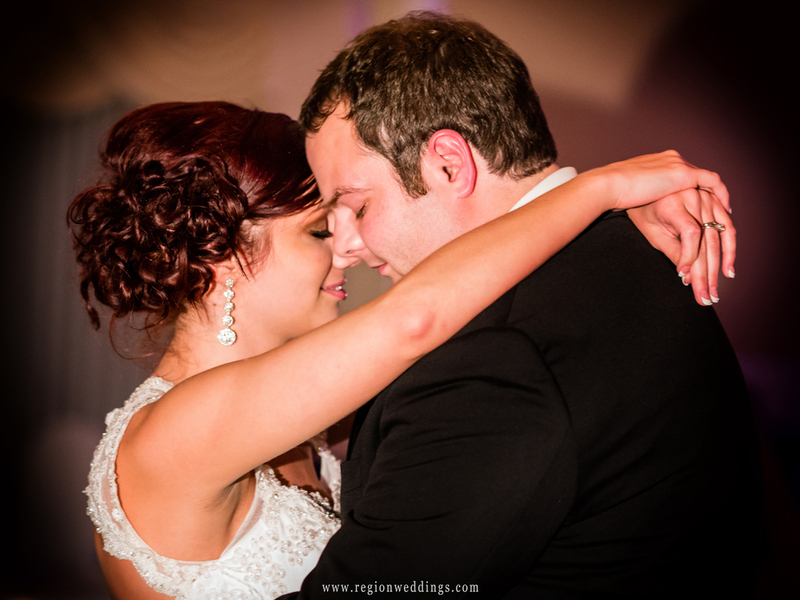 The bride and groom take their first dance during their wedding reception at The Dream Palace in Lynwood, Illinois.